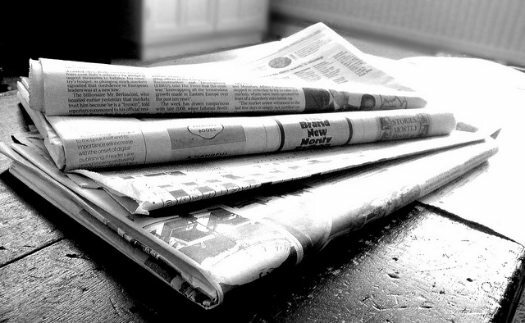 “Newspapers in black and white.” Credit: Jon S.
During the year since it’s opened, the Lenfest Institute for Journalism has been making headlines regularly and drawing new attention to a field that has been having a hard time finding its footing. In February, NPQ covered Lenfest’s joint announcement with the Knight Foundation of a new initiative to support local newsrooms. Earlier this week, the nonprofit announced that it had secured new financial commitments of $26.5 million from a “broad base of national and regional funders” and will soon be kicking off a matching gift campaign. At a time when local journalism is struggling in light of falling advertising and new challenges from online entities, Lenfest’s success at bringing new interest to the possibilities of local news is a valuable case study for the journalism field and nonprofits more broadly. Cable television entrepreneur and philanthropist H.F. “Gerry” Lenfest established the Lenfest Institute with an initial endowment gift of $20 million to support local journalism. (As clarification of this mission, Jim Friedlich, executive director and CEO of the Lenfest Institute, explained to NiemanLab, “National media—like the New York Times and the Wall Street Journal—have a visible path to digital transition, but the Philadelphia Inquirers, the Miami Heralds and Detroit Free Presses of the world, have a long way to go.”) As part of this gift, Lenfest also transferred his ownership of the Philadelphia Media Network, which includes the Inquirer, the Philadelphia Daily News, and Philly.com, to the Institute. The pressure on good journalism is felt most acutely at the local level in markets whose news enterprises are increasingly challenged. There is a growing realization that practical, tangible business solutions are required to address these issues.